We conducted a randomised, double blind, placebo controlled trial to assess the efficacy and safety of cilostazol, a selective inhibitor of phosphodiesterase 3, in patients with vasospastic angina (VSA). Cilostazol has been shown to induce vascular dilatation, but its efficacy in patients with VSA is unknown. 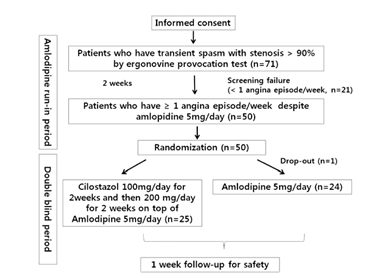 Between October 2011 and July 2012, 50 patients with confirmed VSA who had ≥1 angina episodes/week despite amlodipine therapy (5 mg/day) were randomly assigned to receive either cilostazol (up to 200 mg/day) or placebo for 4 weeks. All patients were given diaries to record the frequency and severity of chest pain (0-10 grading). The primary endpoint was the relative reduction of the weekly incidence of chest pain. Baseline characteristics were similar between the two groups. Among 49 evaluable patients (25 in the cilostazol group, 24 in the placebo group), the primary endpoint was significantly greater in the cilostazol group compared with the placebo group (-66.5±88.6% vs -17.6±140.1%, respectively, p=0.009). The secondary endpoints, including a change in the frequency of chest pain (-3.7±0.5 vs -1.9±0.6, respectively, p=0.029), a change in the chest pain severity scale (-2.8±0.4 vs -1.1±0.4, respectively, p=0.003), and the proportion of chest pain-free patients (76.0% vs 33.3%, respectively, p=0.003) also significantly favoured cilostazol. Headache was the most common adverse event in both groups (40.0% vs 20.8%, respectively, p=0.217). Cilostazol is an effective therapy for patients with VSA uncontrolled by conventional amlodipine therapy, and has no serious side effects.